This basketball system is adjustable, with use of a clamp system. However, it is not as easy to adjust as our crank-handle basketball system. 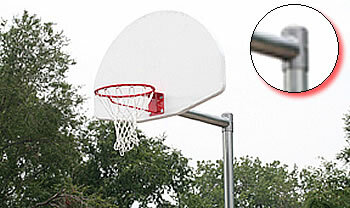 This commercial Adjustable Basketball System (Clamp Mechanism) basketball goal offers height-adjustment on a rugged backstop set. The posts are made out of galvanized steel pipe. Two post diameters are available: 3.5″ and 4.5″. The posts are manufactured by SportsPlay, Inc. The extension on this backstop measures 3′ long. You can lock the extension to the pipe anywhere from ground level all the way up to 10′ high. The extension locks in using 2 set screws. In addition to the post and the extension, you also receive your choice of backboard (aluminum or fiberglass), a metal goal, and a nylon net. The extension on this backstop measures 4′ long, and it’s made from reinforced steel. You can lock the extension to the pipe anywhere from ground level all the way up to 10′ high. The extension locks in using 2 set screws. In addition to the post and the extension, you also receive your choice of backboard (aluminum or fiberglass), a metal goal, and a nylon net. The post measures 13’6″ long. Got questions about the special needs basketball equipment? Just phone us TOLL FREE!